Dojran ... Along the west shore of the Dojran Lake, in the south-eastern part of Macedonia, there are the small fisherman's towns Nov Dojran and Star Dojran, which are a fusion of old ruins and newly built buildings, modern hotels and holiday resorts and restaurants. Nov Dojran, represents a settlement from the period between the world wars. Nov & Star Dojran are located on 170 km from the capital Skopje and from the nearby city Strumica, are just 59 away. Dojran area has been settled since pre-historic times. In the 5th century AD, the Greek historian Herodotus, writes of the Peons, people who settled the lake shores. According to his notes, they lived in dweller settlements accessible only by boats. These constructions can be seen in the present day, as well, on the west and the north shores of the lake, in between the cane zones and the peaceful lake waters. Fishing has always represented the basic economic activity of the citizens on the lake. 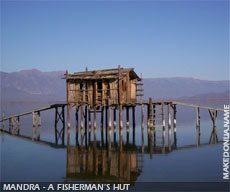 Especially interesting for the tourists as mentioned is the traditional ancient fishing method used by the Dojran fishermen. In 1431, Dojran was conquered by the Turkish invaders, led by the colonel Evrenos-bey. A legend still lives among the population, connected to the day when the Turks conquered Dojran. That day, the lake was frozen and covered with snow. Everywhere around, there were fierce snow storms which made recognition of the roads almost impossible. Not knowing of the lake, the Turks actually passed over it. When the next day, Evrenos-bey found out that the soldiers had crossed the ice, he believed that Allah had taken his army under his protection. He ordered immediate preparations for a large feast. The memory of that feast and the joy gave the city, the name: "Dojurmak", or "Dojaran" - which translated means feast. During the Turkish rule, Dojran developed following the typical Turkish model of an Islamic city. The upper part was Turkish, with narrow streets, and the lower part was Macedonian, crossed with wide streets and modern public buildings. The houses were two-storeyed, arranged amphitheatrically, with a view onto the lake. Such an appearance resembled Salonica, therefore Dojran was called "Small Salonica". Close to the lake shore, was the Bazaar with 300 shops and crafts workshops. Because of the beauty of the city, it was settled by many Turkish dignitaries. During the First World War, the airplanes and the cannons of the Entente completely destroyed the city. The former beautiful city with beautiful houses, numerous restaurants along the lake shores and the vivid Bazaar, vanished for ever. The population, which during the terrifying bombardments, deserted the city, after the war returned to the city, and formed the new fisherman's village Nov Dojran. Today, the two villages, Nov and Star Dojran, spillover in one urban entity. The newly built modern buildings, mainly for the purpose of developing the tourism, are located in Star Dojran. In the vicinity, there are several cultural-historic monuments; what is left of those more numerous ones, destroyed during the First World War. The Clock - Tower was built in the 14th century. According to the legend passed down through many generations, the Tower was built by Evrenos-bey, in honor of the conquest of Dojran. During the First World War, the Tower was partially destroyed, and it remains in the same condition today. The Amam - Turkish bath is located in the upper part of the city, inhabited by the Turkish population, in the past. The time of construction is not known. Only some parts of this tower have been preserved to the present day. 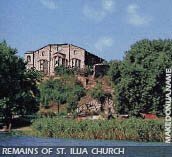 The church of St. Ilija was built in 1874. There are remains of this church in the north part of the city. Judging by the remaining walls and the big altar inside, the church was an impressive building. Some of the walls, retain fragments of paintings, which suggests that the church walls were originally covered with frescos. This area is very significant archeologically. The numerous findings of accidental or systematic excavations, have often attracted the attention of archeologists. These include lot of relief, marble plates with Greek inscriptions, remainders of walls, coins and tombs with epitaphs which all are witness to the settlement of the area since ancient times.